When downed corn disrupts harvest season, the potential for yield loss should never be underestimated. 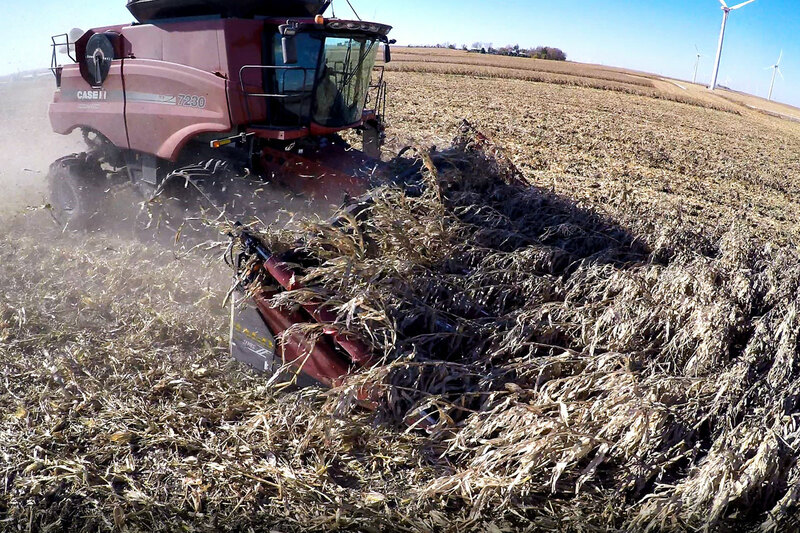 “It’s not uncommon to see 10 to 20 bushels/acre of yield loss in downed corn, and in severe cases, losses can accelerate up to 50 bushels/acre,” says Fenton, Iowa farmer and Dragotec President, Denny Bollig. Although severe storms and high winds contribute to stalk lodging and downed corn, crop conditions throughout the planting and growing season can also impact the likelihood a downed corn event will occur. Deterioration of stalk material from plant diseases, like corn root rot, or infestation from insects, such as stalk borers, can also cause premature plant break-off or lodging. Because these conditions can change so rapidly across the field, it’s a good idea to scout fields for problem areas and check the condition of stalks and ears when beginning harvest. “As plant material starts to dry out and break down, yield loss potential mounts quickly,” says retired Iowa State University Extension ag engineer Mark Hanna. Set deck plates carefully. If a producer is running a corn head with hydraulic or bolted deck plates, make sure they are “only slightly wider than cornstalks” in order to cut down on stalks breaking off before ears can be removed. If running a Drago corn head with automatic self-adjusting deck plates, variable stalk sizes are accounted for in each individual row. Get low, but not too low. “Operate the head as low as practical without picking up rocks or significant amounts of soil,” Hanna says. Adjust how you drive. Moving against the grain of the stalks of downed corn can reduce harvest losses. “Evaluate losses, though, before spending large amounts of time dead-heading through the field,” he adds. Slow everything down. Harvesting slower than normal in downed corn is typical. Make sure everything is adjusted to account for the necessary slowdown. “If harvest speeds are significantly reduced, the amount of material going through the combine is reduced. 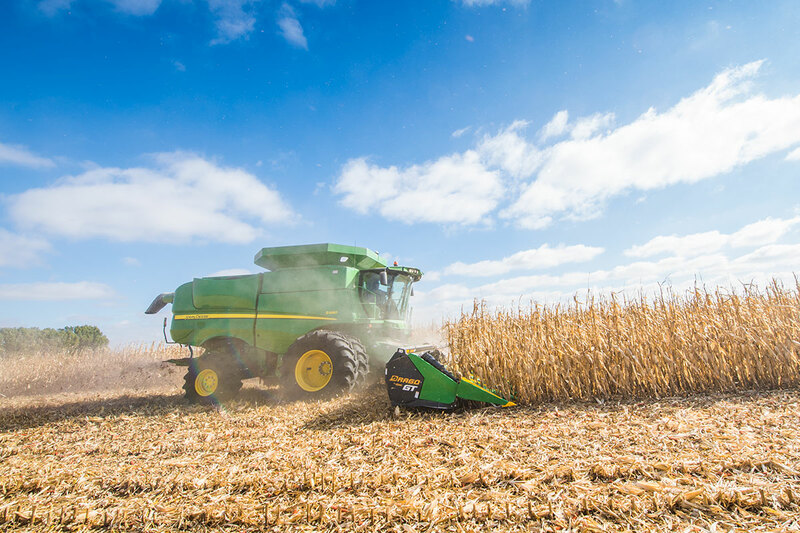 Fan speed may need to be reduced to avoid blowing kernels out of the combine and rotor speed may also need to slow to maintain grain quality. Check kernel losses behind the combine and grain quality to fine tune cleaning and threshing adjustments,” says Hanna. Once the machinery has been adjusted, Hanna adds it’s important to remember that harvesting downed or lodged corn takes longer than standing corn. 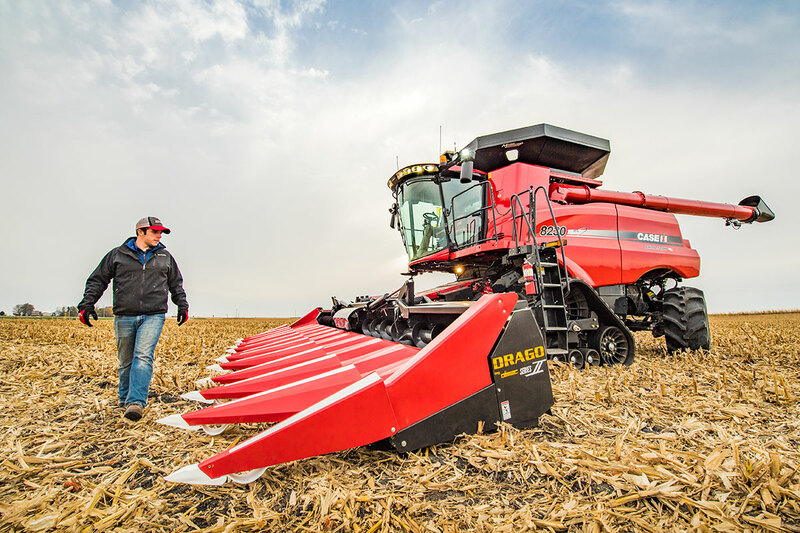 “Downed corn is never a problem producers want to deal with during the urgency of harvest, but having a corn head that can handle downed areas from both directions in the field means big cost and time savings,” Bollig says.